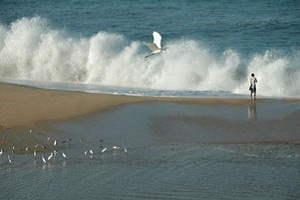 Mayto beach and the surrounding areas are making the transition from spring to summer. The seasonal tourists have headed back to their summer homes and the last signs of seasonal visitors are disappearing. It is quiet and a good time to visit. It has been a very dry season, so the first rains have been welcomed. The trees and plants are starting to green, and flowers are popping up where you would least expect them. The ocean water has warmed and there are many fish in the area now. The fishermen from Tehua and Corrales are having good catches. It is also a good time for sport fishermen to start thinking about trying their hand. The swimming is refreshing and welcomed at the end of a warm day. For first time visitors to the area, this ends the driest time and one extreme of the landscape. Now through October, brown turns to green. 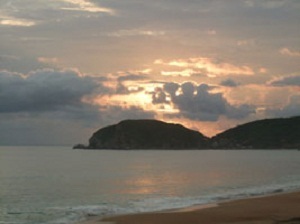 This is part of what makes the Mayto area different from Vallarta. It is drier and arid with a little less humidity and a different pattern to the rainy season. No matter what time you visit, you will still be amazed at the endless miles of beach. Some say the summer is the best time to be here, just after a good rain. This summer should see continuation of another section of surfaced road. And, it is rumored that another section will start soon. The road project is now part of a larger Federal plan that includes the water reservoir that started a couple of years ago. Survey crews have been actively working for the last four months along much of the un-surfaced road, a good sign that something is happening. Again this is part of the grand plan for the region. A surfaced road from El Tuito all the way to Mayto and continuing to Arquiles Serdan, along with the water reservoir, are the key to opening this area to future tourist development. There continues to be speculation about land deals and the start of big projects. Mostly things are changing little by little on a community level. New people are coming to the area and some are returning after trying their luck in the U.S. For certain, everyone is aware that in the next few years, there will be many changes. Good and bad. In the meantime, Mayto, Tehuamixtle, and surrounding areas are well worth a visit. More visitors are coming every year to this beautiful beach area along the south coast. Just two hours from Puerto Vallarta. Go south on highway 200 into El Tuito, and then head to the coast. Look for Mayto Hotel signs to guide you.